Meet Brian O’Connor, Nashville-based colorist and close friend of Hayley Williams. Brian has worked with Hayley since 2007 when they met on the set of Paramore’s video “crushcrushcrush” and they have been “Ride or Dye” friends ever since. Recently, Brain teamed up with Hayley and L’Oréal alum Erik Hoover, to launch Hayley’s dream project the “goodDYEyoung” hair dye company. goodDYEoung, is a vibrant hair-dye line designed for in-home use, and features a color wheel of five fragrance-free, vegan, and cruelty-free shades (Rock Lobster, Blue Ruin, Ex-Girl, Steal My Sunshine, and Riot), priced at $14 each, exclusively sold online at goodDYEyoung. 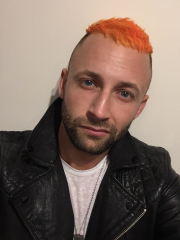 When he’s not on the road with Hayley, Brian is a stylist at Nashville’s exclusive “Fresh Salon” and we recently caught up with him in between gigs to find out a little more about the superstar stylist with a quick round of 5 in 5 POP Quiz. Check it out. 1. HOW DID YOU END UP IN THE CAREER THAT YOU HAVE NOW? I’ve always loved hair and makeup since I was a child. When growing up, my best friend’s mother was a hairstylist and I would love going to her salon to watch or help out. I’ve known since I was 12 years old that all I wanted to do (for a career) was to make people feel amazing about themselves, simply by fixing their hair or makeup. 2. WHERE DO YOU LOOK FOR INSPIRATION TO CONTINUE TO KEEP THINGS FRESH AND NEW WITH YOUR CLIENTS? BLOGS? SOCIAL SITES? FASHION SHOWS? Hmm… I think I just draw a lot of inspiration in life, walking down the street and coming into contact with people inspires me, I’m constantly looking at someone and thinking “OH they look badass or gorgeous, how can I take that and put my twist on it”? I’ve never been huge on blogs, but I do find Instagram really inspiring, I also look at a lot of magazines. 3. WHAT IS YOUR SPIRIT ANIMAL? WHY? BEYONCÉ! Can she be a spirit animal?!? I just find her very confident, strong, focused and driven in her career. It’s very inspiring. I want to achieve that with hair and makeup LOL. 4. WHAT’S THE MOST POPULAR MOMENT IN YOUR CAREER SO FAR? goodDYEyoung! Being able to help start and launch this line, with my best friend (Hayley Williams), has been more than life changing. I’m so proud and excited about it. We’ve put a lot of time and effort into making it amazing and I just want everyone to see and feel it! 5. WHAT “POPULAR” CLIENT HAVE YOU WORKED WITH THAT MADE YOU FEEL LIKE YOU MADE IT? Hayley Williams!! She’s the reason I’m able to be featured here in this article. I’m thankful that she has allowed me to live out my life’s dreams, without her ever knowing it. Thankful to call her my Best Friend more than anything!